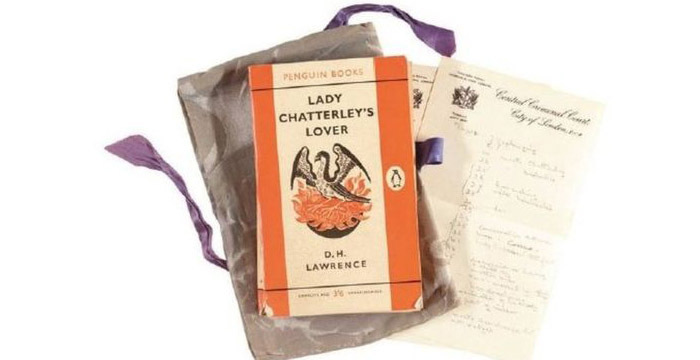 A copy of Lady Chatterley’s Lover used by the judge who presided over one of the most well-known obscenity trials in British literary history has been sold for £56,250 at Sotheby’s auction house. The 118-page book, which was initially expected to fetch between £10,000 to £15,000, was sold to an anonymous online bidder for nearly four times the pre-sale estimate on Tuesday. The lot included a special hand-stitched damask bag created by the wife of Mr Justice Byrne, the judge in the 1960 trial, to carry the salacious novel to and from the Old Bailey. It also included notes Lady Byrne had compiled on Central Criminal Court notepaper. The racy novel, written by DH Lawrence, tells the story of the titular Lady Chatterley, a young, female aristocrat, who has a passionate affair with her husband’s gamekeeper. The jury trial centred on whether or not it should be published in English (from French) by publishing house Penguin or whether it broke obscenity laws. The jury found in favour of Penguin and, within days, the book’s publication in the UK went ahead — paving the way for a new, liberal Britain and the start of the swinging ‘60s. Tuesday’s sale set an auction record for a Penguin paperback. The judge’s copy was previously owned by Stanley Joseph Seeger, an American art collector who acquired the piece of legal history from Sotheby’s for £4,370 more than 25 years ago. Did the judge buy this with his own money, or was he provided with it? If the latter, why was it his to sell on? If he had had the misfortune of being a solicitor, the SRA would be demanding his exhumation and beheading at the very least. Don’t forget the large wedge of costs that they would help themselves to, from his estate, for the privilege! But then you are only 13, aren’t you? You’d like that wouldn’t You, dirty paedo. I was commenting on the maturity of the comment. He who points the finger has three pointing back at himself. Got something to hide, maybe? I have nothing to hide. All the girls I sleep with are no younger than 18. No older either, mind you. 2 Words – best track on the College Dropout album. No, ‘that’s four words’ is three words. Such a cucky novel in the first place. Tha’s got the nicest arse of anybody. It’s the nicest, nicest woman’s arse as is! An’ ivery bit of it is woman, woman sure as nuts. Tha’rt not one o’ them button-arsed lasses as should be lads, are ter! Tha’s got a real soft sloping bottom on thee, as a man loves in ‘is guts. It’s a bottom as could hold the world up, it is!